What the Heck is ASMR? – Recovery Now, Inc. I was 11 years old and trying to beat the summer heat. I decided to mope into my aunt’s house and watch TV. Since it was mid-day in the summer, program selections were few. I settled on a soft-spoken man with a perfect brown Afro standing next to an easel and bright white canvas. There was something about his voice and the sound of the paintbrushes on the canvas. I suddenly felt like my brain was being massaged. I gently fell asleep on the shag carpet of my aunt’s living room. Over a decade later, I discovered that what I had experienced had a name: ASMR. ASMR, is the acronym for autonomous sensory meridian response. ASMR faithfuls describe it as a feeling of relaxation and euphoric tingling that occurs when they encounter certain stimuli or triggers. These triggers take many forms but are usually experienced through a plethora of audio/video clips found on YouTube. The science is not fully understood but ASMR could be associated with “awake” and “rest” neural pathways being activated simultaneously. Examples of triggers include: whispering, fingernail tapping, sounds of pencil writing, and videos of haircuts, massages, and even chiropractic adjustments. Newcomers often peruse videos to find triggers that work for them. 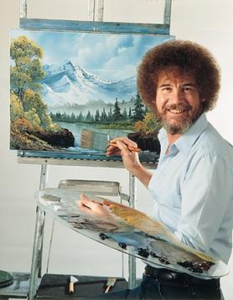 Mr. Ross’ legacy includes amazing landscape portraits and 403 episodes of ASMR gold. See if the video below works for you. If not, don’t worry, type “ASMR” into the YouTube search bar and let the tingles commence.